Birthplace : Antiock, Indiana, U.S.
Ellwood Patterson Cubberley an early 20th-century educator and university dean, wrote influential textbooks in the history of education and public school administration. He played a major role in the professionalization of teaching and administration and in elevating education to a university study. Ellwood Patterson Cubberley, the only child of Edwin Blanchard and Catherine Coryell Cubberley, was born in Antiock (later Andrews), Indiana, on June 6, 1868. His mother was of Delaware Quaker ancestry and his father, a druggist, was English. Ellwood attended the local schools of Antiock and the college preparatory school at Purdue University. In 1886, impressed by David Starr Jordan's lecture "The Value of a College Education," Cubberley persuaded his father to let him enter Indiana University where Jordan was then president. There he studied physical science and in his senior year became so skilled in managing the stereopticon lanterns that Jordan chose him as lantern assistant for his many illustrated lectures. Cubberley also enrolled in Jordan's course on evolution, a course known later at Stanford as "bionomics." The study attempted to blend the "natural and social sciences with old fashion pietist religion." Later, Cubberley made the course a requirement for education students at Stanford. The relationship established between professor and student at this time was significant in Cubberley's career choices. In 1888-1889 Cubberley interrupted his work at the university to teach in a one room school in Indiana. In the winter of 1891 he completed the A.B. degree from Indiana University and began teaching science at a Baptist college in Ridgeville. In the fall of that year he became professor of physical science at Vincennes University. At 25 he became president of the university, a post he held for the next three years. In June 1892 he was married to Helen Van Uxem, who had been a fellow student at Indiana. In 1896, upon the recommendation of Jordan, then president of Stanford University, Cubberley was hired as superintendent of schools in San Diego, California, and immediately became the center of a political controversy. Several school board members who had wanted to hire a local person questioned the legality of Cubberley's credentials. The case was taken to court but was settled in Cubberley's favor. What disturbed the new superintendent was the functioning of the school board. It was the board rather than the superintendent that administered the schools. Cubberley worked hard to convince the board that it should act as a legislature and leave administration to him. From his experience in San Diego Cubberley's theories of school administration would later develop. He became convinced that school boards should be non-political and that executive autonomy was essential to efficiency in education. In 1899 Cubberley accepted an appointment as assistant professor and acting head of the Department of Education at Stanford University. Once again he was to be associated with his mentor, Jordan. Within two months, Jordan made Cubberley's appointment permanent but gave him three years to "make education respectable" or have it abolished. The obstacles appeared insurmountable. In the first year Cubberley had to teach five courses in administration and the history of education, courses in a field for which he was not trained and in which there was little scholarly literature. Faced with the challenge of convincing his colleagues of education's worth, he had the additional burden of discovering what it was he should be teaching. Before the end of that year, however, Jordan had been persuaded to retain the Education Department. In 1906 Cubberley was made a full professor, and in 1917 the trustees created a professional school of education and made Cubberley its first dean. In 1901 Cubberley, taking a leave, attended Teachers College, Columbia, where he received the M.A. degree in school administration. He returned two years later as a student in the Ph.D. program and completed his dissertation on "School Funds and Their Apportionment." The experience at Teachers College, where the new scientific method was being emphasized, intensified Cubberley's commitment to public education. His basic interest in social efficiency and his faith in science had been reaffirmed. 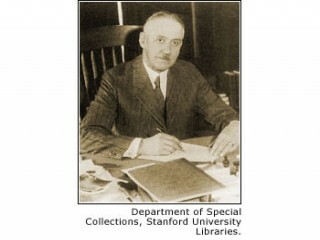 Returning to Stanford, he wrote and published a brief essay, Changing Conceptions of Education (1909), in which ideas basic in his later writing were first explored. Recognizing the impact of the new industrial age, Cubberley saw education as social engineering and the schools as instruments of progress. In this new age children needed to acquire skills and knowledge taught in schools because no longer could the needs of an urban/industrial society be provided by informal processes. Moral direction, for so long the province of the home and church, must now be left largely to the school. The school, too, must respond to immigrants from southern Europe who were crowding the cities of the Northern Atlantic and Central states. The school's task, Cubberley wrote, was "to break up these groups or settlements, to assimilate and amalgamate these people as part of our American race, and to implant in their children so far as can be done, the Anglo-Saxon conception of righteousness, law and order and popular government." Believing in Anglo-Teutonic superiority, Cubberley became convinced that the curriculum had to be adjusted to meet the needs of children of different abilities. In order to achieve such an adjustment, Cubberley proposed a school system appropriate for such a task. He recognized in his Public School Administration (1916) that "Schools are in a sense factories in which the raw materials (children) are to be shaped and fashioned into products to meet the various demands of life." School boards must be non-partisan, teachers knowledgeable, and school superintendents should operate with the efficiency of industrialists. In the many publications throughout his career Cubberley expanded and reinforced the social philosophy sketched in Changing Conceptions of Education. His biases, so obvious today, were not criticized during his lifetime, mostly because his students and readers shared these beliefs. Although considered a pioneer in American educational history, Cubberley's abiding interest was administration. History to Cubberley became a useful tool for promoting his ideas of education. In this sense it celebrated the rise and development of universal public education, providing inspiration and direction for a developing profession. Because of his extensive use of the writings of school officials and reformers, his critics have suggested that the result was a narrowly construed "house history by and for schoolmen." Cubberley's productive capacity was amazing. He was author or co-author of nearly 30 books and reports and numerous articles. Between 1911 and 1913 he served as departmental editor for the Cyclopaedia of Education in charge of educational administration. For this he wrote over 130 articles. The first edition of his Public Education, in the United States (1919) sold over 80,000 copies, and by 1939 nearly 70,000 copies of History of Education (1920) were in use. As editor of Houghton Mifflin's Riverside Textbooks in Education, he edited almost 100 volumes in the fields of measurement, guidance, methodology, psychology, sociology, and administration in education. He was a popular speaker and lecturer and a pioneer of the school survey movement. Cubberley retired in 1933 and spent his remaining years planning the disposition of a fortune amassed over the years through careful investment. He and his wife left to the Stanford School of Education over $770,000. On September 14, 1941, Cubberley died of a heart attack. He was buried at Alta Mesa Cemetery near Palo Alto, California. Cubberley is listed in the National Cyclopaedia of American Biography. A comprehensive but devotional biography by Jesse B. Sears and Adin Henderson, Cubberley of Stanford and His Contributions to American Education (1957), is an excellent factual resource and includes a full listing of Cubberley's writings. Two significant criticisms of Cubberley's works (especially the histories) appeared in the 1960s: Lawrence Cremin, The Wonderful World of Ellwood Patterson Cubberley (1965); and Bernard Bailyn, Education in the Forming of American Society (1960). In this same vein two other sources of the 1960s merit attention: William W. Brickman, "Revisionism and the Study of the History of Education," History of Education Quarterly (December 1964); and Raymond E. Callahan, Education and the Cult of Efficiency (1962). View the full website biography of Ellwood Patterson Cubberley.